aShortChronicle has been telling readers about the brinksmanship going on in Raleigh as CMS does whatever it can to stop municipal charter schools from opening and diluting its control over education in Mecklenburg County. Keep in mind, none of the towns that have been granted permission for these schools have applied to open them, or that these municipal charter schools would alleviate future overcrowding since CMS does not plan to build more schools in North Meck for the next decade. That hasn't stopped CMS and Governor Cooper from moving to thwart them even as a possibility. As expected the swirl around this went down to the wire, but in the end, it wasn't really that close. As one of its final acts before adjourning, the Republican supermajorities in Raleigh overrode Roy Cooper's veto of S469 on Thursday. That's the catch all "technical corrections" bill that included a provision allowing employees of any future municipal charters to join State benefit programs. CMS has vigorously opposed this bill due to it including this provision and Governor Roy Cooper cited this provision as one of the reasons he vetoed the bill. On Thursday, the House voted 70-40 and the Senate voted 31-10 easily surpassing the 60% of votes cast needed for an override. Outgoing NCGA members Rep John Bradford and Sen Jeff Tarte voted to override the veto in what were largely party line votes. Three Democrats in the Senate also voted to override the Governor. With Republicans losing their supermajorities in the next Legislature, votes like the one in the Senate could be more interesting. Republicans will hold 29 seats in 2019, one short of what is needed to override a veto. However, in a hypothetical situation where they peel off 3 Democrats, they could still override vetoes in that chamber with all members present. On the House side it will be more difficult to do the same. Republicans will hold 65 seats, but need 72 votes to override if all members are present. Getting 7 Democrats to cross the line will be much more difficult. However, overrides could still happen if more Democrats are not present for some reason allowing the 60% threshold to be met with less than 72 votes. That is effectively what happened this time with Republicans only needing 70 votes to get 63% of the votes cast. Mecklenburg County will likely be even more on the outside looking in during the 2019-2020 session than it has in the past. With only one Republican (Sen Dan Bishop of South Charlotte) as part of the Mecklenburg delegation it is hard to see the county getting a lot of love from the new legislature if it means giving Democrats political wins. How the county's new NCGA members navigate that environment will be interesting to watch. Democrats Natasha Marcus of Davidson and Christy Clark of Huntersville are set to be sworn in next week as the area's new Senator and Representative as Tarte and Bradford leave office. 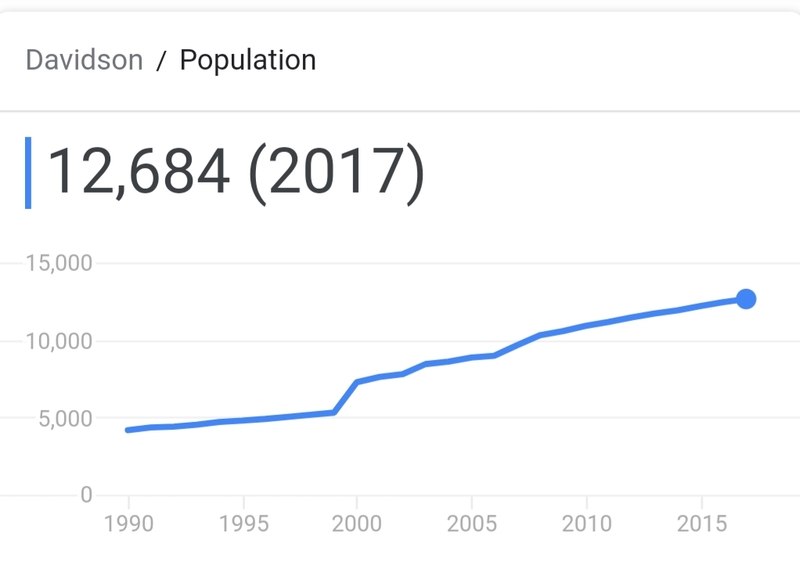 aShortChronicle told readers back in June that new neighborhoods coming online would accelerate Davidson's growth rate in coming years and a quick count of these seems to confirm that. 2017 data shows Davidson continuing to add people at the same rate as in previous years with 230+ coming to town between 2016 and 2017. That rate may stay the same when 2018 data comes out halfway through next year, but residents can expect that to increase in 2019 if the current rate of buildout continues in the mega devopments of Davidson East and Westbranch. In June, aShortChronicle posited that if these two developments built out over 3.5 years that would total 150+ new homes and 400+ people per year in these two developments alone. After a drive through these new developments this week with roughly six months of home building completed, there are already nearly 150 homes either built or in various stages of construction. That could possibly yield a much higher annual rate than used in the June estimates. However, it could also just be prepping inventory for the coming Spring selling season. Only time will tell on that. What can be passed along now is that several of the current sales in Westbranch appear to be to an investment company. That is per data in the Mecklenburg County Polaris system. According to Polaris, in late November/early December no less than 8 homes were purchased by and entity named AMH NC PROPERTIES TWO L P with a mailing address in Agoura Hills, CA. A Google search of the address says that is for the company American Homes for Rent. In a season characterized by goodwill, the Davidson Lands Conservancy (DLC) announces a generous gift of conserved land in Davidson, N.C., located near the Pines at Davidson, a retirement community, and proximate to the historic part of the Village. In addition to donating the conservation easement, the landowners also contributed all the transaction closing costs and created an endowment to ensure the land is stewarded and the conservation agreement defended, forever. While they wish to remain anonymous, they are happy for DLC to share this news, hoping to encourage similar gifts within and around Davidson. “We and our neighbors have long enjoyed the varied wildlife — birds, deer, foxes, box turtles, and even a marmot — supported by the undeveloped land. We want future generations to have that opportunity as well,” the donors said. The project conserves about 10 acres of land that — although well suited for real estate development — will now remain forever natural. The public benefits of this project include permanent conservation of rapidly diminishing open space in the Village; natural habitats for wildlife, plants, and supportive ecosystems; and watershed and water quality. Additionally, while access to the property is limited, the conserved land is available for conservation, education, and research, including student and faculty projects associated with Davidson College. DLC will monitor the land and work in partnership with the owners to ensure the conservation values are protected and, where possible, enhanced. The DLC also hopes to expand the conservation area and the project’s impact by working with interested neighboring property owners. A conservation easement is a common legal tool that permanently conserves land. Each easement is unique to the protected property, tailored to the needs of the landowner and to the conservation values of the property. The landowner maintains ownership of the land and, by the easement, promises to keep the land in its natural condition. The easement is held by a land trust, in this case DLC, which promises to monitor and protect the conservation terms of the easement forever. Conservation easements are permanent and recorded in the land records. The Davidson Lands Conservancy, founded in 2000, is a nonprofit land trust that works with willing landowners to save land in the Davidson, North Carolina, area to preserve a healthy, natural environment for future generations. For more information about DLC’s mission or creating a conservation easement, visit DavidsonLands.org or call 704-892-1910. DAVIDSON, NC – On December 13, the Town of Davidson acquired the five acres of property located at 251 South Street. Are you interested in getting involved in shaping the future of the property? Here's your chance: The Town of Davidson is now accepting applications for appointments to the “South Street Task Force.” The application form is here. Sponsoring public engagement opportunities to solicit community input on ancillary uses for the available community space in the school building and recommend uses to the board of commissioners in March, 2019. Reviewing and giving feedback on the town use of the school building. Developing a master plan for the South Street site, with extensive public input. Phase 1: The task force will be on a tight deadline to provide a recommendation for community space in the school building to the Davidson Board of Commissioners in March. They will begin work in January, meeting approximately every other week, likely during early evening hours. Phase 2: After a short break, the task force will reconvene in early summer to develop a public engagement process to master plan the site, and their meeting schedule will be determined at that stage. For more information, please visitwww.townofdavidson.org/PublicFacilities. To apply for the task force, please visitwww.townofdavidson.org/PFTFApp. After the January 3 application deadline, applications will be reviewed and members will be nominated by an internal committee consisting of elected officials and staff, and approved by the board of commissioners. Dawn Blobaum, Assistant Town Manager, will serve as primary staff liaison for the task force. Please contact Dawn at 704-940-9615 or dblobaum@townofdavidson.org for more information regarding the task force’s work and schedule. Attendees will have the opportunity to speak with our elected officials and town staff to share feedback or fill out a comment card. If you are unable to attend the public input session on this date, please email your thoughts on the plans to renovate the former IB school for public facilities and other uses vs. building a new town hall in front of the existing town hall to PublicFacilities@townofdavidson.org. 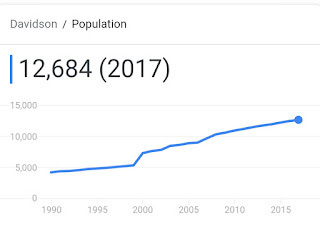 As Davidson’s population has grown from 4,000 in 1990 to almost 13,000 today, we have outgrown our existing town hall. Ensuring adequate space for all departments, board of commissioners' meetings, and community meeting space is particularly critical. We need to invest in our public facilities in order to keep pace with our service needs. In mid-December, the Town of Davidson will purchase the property at 251 South Street, consisting of a school building, gymnasium, parking lot, fields, and green space. For more information, we encourage you to visit www.townofdavidson.org/PublicFacilities. If you have questions or comments, please email us at PublicFacilities@townofdavidson.org. Davidson Village Network (DVN) is pleased to announce a new, rewarding and innovative position; Part Time Director of Operations (DO). The DO will serve as a primary ambassador of Davidson Village Network and should possess a passion for making a positive difference in the lives of senior adults with a special emphasis on addressing the issue of loneliness. The DO will support the execution of the strategic plan including membership growth and fulfillment, communications and sustainability and will engage in service delivery and key operational, organizational and administrative functions as defined by the DVN Board of Directors. − Attendance at Board Meetings is required. Attendance at Committee Meetings and Monthly Member Activities as requested. Send an email with cover letter and resume. Please submit all items as a single attachment and send to dcritchlow@davidsonvillagenetwork.org. • What is your interest and experience in working with senior adults? • What is your leadership experience working with volunteers? • If you were to identify one thing about this position that excites you, what would that be? Open until filled, preferably by end of January. Interviews to commence mid-January. In the closing days of the year, CMS is reportedly encouraging Governor Cooper to veto a bill that would allow employees of possible future municipal charter schools to join state retirement plans. Check out the below from this article in Thursday's Raleigh News&Observer. Senate Bill 469, which makes technical corrections to several state laws, goes to Gov. Roy Cooper for his signature. The Charlotte-Mecklenburg school system is asking Cooper to veto the bill because it would allow teachers in any municipal charter schools opened by four Mecklenburg towns to join the state retirement and health systems. Former Rep. Charles Jeter, who’s now government relations coordinator for CMS, said the district is against the bill because it will make it much more likely for those municipal charter schools to open. Senate Bill 469 passed on Thursday and includes numerous other changes besides this one which affects the towns in Mecklenburg County allowed to consider opening their own municipal charter schools. It will be interesting to see what Cooper does here considering that we are at the end of the year and the end of the legislative term. According to StateScape.com, which tracks differences in how states handle various issues, North Carolina could see this bill become law the following ways with or without Governor Cooper's signature. The governor must sign or veto legislation within 10 days after transmittal, or it becomes law without his/her signature. If the legislature adjourns for more than 30 days, the governor must act within 30 days after adjournment, or the legislation becomes law without being signed. If the governor vetoes legislation after adjournment, he/she must reconvene the session or the legislation becomes law despite the veto on the 40th day after session adjournment. It is unclear exactly how this might ultimately play out since new legislators are going to be sworn in starting January 1st after this past November's election and the new legislature would be able to sustain a veto. This bill also contains things Democrats outside Mecklenburg may like such as preventing state takeover of certain failing schools. It sets up the scenario of the Republican controlled legislature forming bills that can peel off Democrats over local issues to cobble together the votes for veto overrides. In this case that override would come at the expense of what Democrats in Mecklenburg County may want. Since Charlotte-Mecklenburg is in the complete control of Democrats now at the city, county, and legislative levels, this is something people should expect to see over...and over...and over again in the coming Republican controlled legislative session. What is clear is that CMS is willing to go to any length to stop municipal charters from opening - including preventing retirement and health benefits for any teachers who might choose to teach in one. See the latest on this story from the Observer. A game of Christmas Chicken is being played in Raleigh over municipal charters. One year ago this week, Davidson swore in five new elected officials after a statement election that saw the previous elected regime at Davidson Town Hall soundly defeated. This was the culmination of years of Town Hall initiated controversies and came after a particularly contentious year where the public, via the Save Davidson movement, became vigorously engaged in municipal affairs. In the run-up to Election Day 2017, those defending the status quo questioned, mocked might be a better word, the qualifications of challengers who hadn't been indoctrinated in the ways of Davidson Town Hall, engaged in anonymous attacks including a smear of Save Davidson to the state BOE, and spread fear and speculation at the possibility of what might happen if wholesale change actually did come to fruition on the Davidson Board. However, when the votes were finally counted none of those tactics mattered a bit. New voters flocked to the polls and cast their ballots for the challengers and incumbent Commissioner Jim Fuller who had often voted against the status quo at Town Hall. When the fog lifted, it was clear a new day was about to dawn. So, how has the new Board performed in the past year? The answer to that is told as much by what hasn't happened as much by what has. The past year has seen a distinct lack of major Town Hall initiated controversies. That's been a welcome relief for those weary of constantly having to fight the bad ideas of years past. The most contentious issue, at least from the public's perspective, came early in the term when the Town considered putting a left turn on Main Street - impacting public parking regularly used by DCPC. The new Board handled that well by not ramming the project forward in the face of public input. Speaking of public input, the past year has also not seen the instances of highly choreographed public input sessions with seemingly predetermined outcomes. Those sessions had become the hallmark of Davidson Town Hall in recent years when the Town repeatedly tried to push through unpopular development proposals. Certainly, some people may not fully agree with this one, but most would likely agree, Town Hall listens better than it has in the past. Finally, the condescension and general blow-offishness that was often the response to any criticism, no matter how slight, by many on the previous Board has gratefully left the dais. All the while, this new Board has been getting things done - proving the concerns of those defending the status quo of years past were unsubstantiated. The Beaty Street Park is underway with the formation of a taskforce busy at planning. The CMS property on South Street has been purchased for a reasonable price - laying the foundation for addressing future public facilities needs. The Board has dealt with multiple planning related issues including the watershed ordinance, legal challenges on the Griffith Street Hotel and Potts Street projects, kick starting a new Comprehensive Plan, and a series of decisions that show a strong preference for historic preservation. That's a very solid list for a group of new folks who supposedly did not have the necessary experience. Is there more to do? Of course! The Continuum conundrum has received little attention. Yes, David Auger, CEO of the enterprise, gave an upbeat presentation to the Board in November, but there still doesn't seem to be a viable long-term plan for extricating the Town from the business other than to keep paying down debt and hoping things don't blow up again. When it comes to business decisions, hope is not a plan. Also, many of the same players on Town Staff who were involved in previous controversies are still in their positions. Until that changes, there will always be the chance for backsliding. This kind of change is hard, and hoping voluntary attrition will provide it likely won't get there. Again, hope is not a plan. All in all though, not too shabby for a Board the old status quo thought was unqualified. They've restored confidence in how Town Hall operates and done so very quickly. That's no small accomplishment in year one, and the Town should look forward to what this group does in year two. Mooresville, N.C. – Continuum announced today that it is increasing Internet speeds for its residential customers by up to 100%. In addition, monthly service rates will remain the same. This means Continuum customers will get up to double the speed at no additional monthly charge. These new broadband speeds position Continuum as one of the most competitive providers in the market. See the chart below for a listing of the previous internet speeds and what is now being offered. Customers will receive a mailer notifying them of the speed increases they can expect. Also, to better satisfy the needs of high bandwidth users in Mooresville, Davidson and Cornelius, Continuum is introducing a brand new, even faster, speed called Ultimate Broadband at a remarkable 500Mbps X 20Mbps. “We recognize the wide-ranging bandwidth requirements our customers have and want to provide a solution for those varying needs,” said David Auger, CEO of Continuum. “From the average Internet user to the heavy gaming household with multiple devices, we strive to offer our customers options that rightly work for them,” he added. The actual increase of speeds will occur on Friday, November 30. Customers may need to do a simple reboot of their cable modem. Continuum fiber-to-the-home customers will not see a change in Internet speeds and will continue to enjoy speeds of up to 1 GIG. The development community does not like being told 'No' by the people in the actual communities it wishes to serve. That's the underlying message from a complaint filed October 29th in Mecklenburg Superior Court against the Town of Davidson regarding the Town's denial of water and sewer extension for the controversial Potts Street Project. aShortChronicle has obtained a copy of the full complaint filed by Plaintiffs Davidson Acquisition Company, LLC and Crescent Acquisitions, PLC against the Town of Davidson and Jason Burdette, the Town Planning Director. The Town was served on 11/5/2018 with Town Manager Jamie Justice accepting service on behalf of both the Town and Burdette. It should be noted that "Burdette is a party to this action solely in his official capacity as Planning Director of the Town." He is not being sued individually it seems. The complaint alleges the Town and Burdette acted illegally by not approving the Potts Street project Master Plan. Most of the claims revolve around the Town not being able to enforce its new Water/Sewer Extension Policy which the complaint calls "standardless" and "arbitrary". When the Town clarified the Water/Sewer Policy back in August of this year to require the Board vote on any new extensions, the Board immediately used the policy to vote down an extension for the Potts Street project - effectively killing it. What may be of more interest to readers is how the complaint alleges things got to this point. The complaint puts the blame for creating this situation squarely on Save Davidson, the local community activism organization. for spearheading last year's turnover at Davidson Town Hall. The complaint puts it this way. "Following municipal elections in November 2017, there was a wholesale change in the Town's governance, wrought by anti-development forces. The anti-growth forces were specifically opposed to the Project and made their opposition well known to the Town and its officials, including the Planning Director." That's on page 2 of the complaint. Who knew that simple citizens wanting to protect their quality of life, restore respect in their local government, and exercise their right to vote could be confused with "anti-development forces"? The attorneys for the development community get more specific about Save Davidson on page 9. "Opposition to the project was spearheaded by an organization known as Save Davidson, Inc a North Carolina Corporation ("SDI"). Opponents of the project objected in particular to its inclusion of apartment buildings, even though apartments were a permitted building type in the Village Infill Planning Area. SDI was instrumental in orchestrating a wholesale change in the composition of the elected leadership of the town. In a fundraising appeal posted on its Facebook page on or about June 1, 2018, SDI boasted of its "accomplishments" over the prior year, including the fact that it had changed the face of the Davidson Town Board and that it had supported residents in their opposition to the "Potts Project". Candidates for office endorsed by SDI who won their elections in November 2017 included Rusty Knox, candidate for Mayor, and David Sitton, Matthew Fort, Autumn Michael and Jim Fuller, candidates for Town Board. In the November 2017 election, Knox unseated the incumbent mayor in his race, and Sitton, Fort and Michael were newly elected to the town board. Fuller was reelected to the town board." What is interesting about all this is that after receiving this much attention in setting the stage for claims in a lawsuit, Save Davidson is not mentioned again. Save Davidson isn't accused of doing anything wrong or of being involved in this case. So, why was the group even mentioned at all??? Well connected members of the development community for decades have had the inside track to get things done at Davidson Town Hall. Over the past few years, including the 2017 election, they have lost that inside track. In the world view of people used to operating behind the scenes, often anonymously, it must make a lot of sense to see some other "force" in the guise of Save Davidson as the reason. It also shows they are missing the point of what happened in 2017. The election in 2017 wasn't just a few anonymous people in some nameless organization who pulled off a squeaker of an election. It was a very public electoral shellacking of the old guard regime way of doing things. The number of people who came out to vote in the 2017 election swamped previous recent contests and none of the races were remotely close for the incumbents who lost. The people, en masse, voted for change. So, when developers through their attorneys try to cast blame for the demise of their projects on "anti-development" forces driven by Save Davidson, what they are really missing is that it isn't "Save Davidson" who doesn't want bad development projects, it's the People of Davidson who don't want them. Now, to try and get their way on a project nobody in town seems to want, the developers are going to sue the Town. Classy. DAVIDSON, N.C – The Town of Davidson invites all community members to a meeting with Historic Preservation Consultant Mary Ruffin Hanbury on Wednesday, November 28 at 6:00 p.m. at the Davidson United Methodist Church fellowship hall, located at 233 S. Main Street, to learn about the historic district designation process. She will explain the benefits of designation, discuss the process, and answer questions. Please contact Assistant Town Manager Dawn Blobaum atdblobaum@townofdavidson.org or 704-940-9615 with any questions. The ongoing saga of the Griffith Street Hotel project crept another step forward this week with the Plaintiffs against the project filing their Appellee brief in the appeal that is currently underway at the NC Court of Appeals in Raleigh. The developer Defendants filed their Appellant brief last month. It should be noted, the Defendants behind the appeal do not include the Town of Davidson. After the Plaintiffs won a decision in Mecklenburg Superior Court earlier this year based on the Town admitting it did not follow its own Davidson Planning Ordinance, this appeal is being driven by the developer Defendants in the case. In the briefs filed by the parties, the Defendants-Appelants' attorney argues that the lower court erred in its decision and that the Town not strictly following the DPO doesn't matter. The Plaintiffs-Appellees attorney argues that strictly following municipal zoning procedures has already need decided by the Court and that should be the case here. Ultimately, this decision will boil down to the answer to this question. Do planning ordinances need to say what they mean and mean what they say, or can they be interpreted at the whims of municipal planning departments and the attorneys involved in development? Whether or not the Griffith Street Hotel project has a chance to move forward hinges on the answer. Readers can find all the documents for the case here at www.ncappellatecourts.org. No date has been set at this point for further action on the case. The days since Tuesday's disastrous showing by Mecklenburg Republicans has already seen a lot of second guessing and finger pointing as to "why" this happened. Here in North Mecklenburg, a lot of that has centered around the I77 tolls issue and the impact of losing MeckBOCC Commissioner Jim Puckett, Sen Jeff Tarte, and Rep John Bradford. Some social media commentary links the toll issue and divisions in the anti-toll movement as the main cause of these losses by driving single issue voters to the Democrats. However, after looking at the data available so far, it's more likely North Mecklenburg was just caught up in the same anti-Trump "blue wave" that swept suburbs across the nation on Tuesday. That data answers the questions from this post during early voting that indicated such a wave might be building locally. Before getting to the data though, one should ask this. "Does blaming tolls and divisions in the anti-toll movement for the election outcome even make sense?" Not really. Did South Mecklenburg Republicans Andy Dulin and Scott Stone lose their NCGA House seats because of tolls? No. Moreover, they lost their seats by wider margins than John Bradford. Did Democrats sweep the MeckBOCC because of tolls? No, that doesn't make sense either. Yet, Republicans Matthew Ridenhour and Bill James both lost as well as Jim Puckett. The only answer that makes sense for these other races is that energetic and well-funded anti-Trump sentiment drove higher vote totals for Democrats. It was that sentiment, not tolls, that had a negative effect, creating a blue wave in urban/suburban areas of Charlotte that swamped these candidates. So, what does the data tell us about the races in North Mecklenburg? First, as pointed out in above linked post, Tarte was in trouble from the beginning due to redrawing the NC Senate 41 district to be much more Democratic than it had been previously. Turnout of registered Democrats in North Mecklenburg was also higher in early voting meaning Tarte really had no chance to overcome this structural disadvantage on election day. In the new district Tarte would have had to win overwhelmingly in the northern precincts to overcome the advantage Democrats have in the southern precincts. This didn't happen and realistically probably never would, tolls being an issue or otherwise. In a wave election scenario like the one just experienced, outside issues made this comeback even less likely. In the race for MeckBOCC District 1, the toll issue probably helped Jim Puckett, but it was not enough to overcome the increase in Democrats heading to the polls. Of the three North Meck Republicans who lost, Puckett was the most consistently anti-toll. Both Bradford and Tarte had been hit in previous elections with the flipflopper label on the toll issue due to not being ardently anti-toll from the very beginning. Jim Puckett never had that problem as he was one of the original anti-toll warriors. The benefit he received from this showed in the election results. Puckett won multiple precincts that Tarte and Bradford narrowly lost. Puckett's loss rested primarily on major increases in the margin of victory for Elaine Powell in precincts that were already Democratic. Those would be precinct 206 in Davidson and the Charlotte precincts along the district's southern edge. As surprising as it was to see Jim Puckett lose this race it really probably shouldn't have been. In 2014, the last time Puckett had a challenger, he only beat his challenger by roughly 4000 votes. So, while the district had long been in Republican hands, it didn't take much momentum to close that gap. It doesn't make a lot of sense to argue these new Democratic voters came out to vote against Puckett because of tolls. These were "new" mid-term voters because of the "blue wave". It should also be noted that this district did not have redistricting changes. The precincts in it have been the same for past two elections as this one. Puckett actually got 5000 more votes in 2018 than he did in 2014 during the last mid-term election. That increase just got swamped by the blue wave. So while tolls was an issue in this race, Puckett didn't lose because voters abandoned him because of it. Finally, there is Bradford's loss in NC House 98. aShortChronicle took a close look at this race. In this race, redrawing the district should have actually helped John Bradford, not hurt him. A couple Republican precincts were added while Democratic precincts were removed since the 2016 election cycle. Bradford won the previous 2 elections in the old district by wide margins, so it stands to reason he would do better in the new one. That didn't happen. Why? Here is what the data tells us. During early voting, 45% of early voters in this race did not vote at all in the last mid-term in 2014. These "new" voters broke pretty significantly for the challenger giving Clark an 1800 vote lead when early voting was counted. This dynamic of "new" voters for a given type of election was very similar to what happened in Davidson last year when Save Davidson brought in a lot of new voters for a municipal election. Those voters broke heavily towards the challengers. 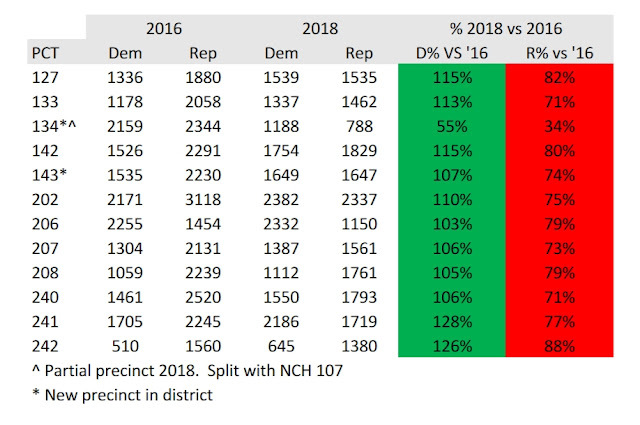 If you compare the precincts in the new NC98 with how those precincts voted in the NC House election in 2016, something is very clear. The Democrats maintained Presidential election year totals or better in these precincts while Republican totals fell off significantly. See the chart below for that detail. Both of these data points indicate high voter enthusiasm among Democrats and lower enthusiasm among Republicans. That level of enthusiasm among one party to vote was not driven by tolls - a bi-partisan issue that has been around for several election cycles. It does not seem reasonable that Democrats suddenly came out en masse to vote over this issue or that unaffiliated voters suddenly turned on Bradford and Puckett specifically because of tolls. That's true no matter how many television ads were run on the issue. aShortChronicle would argue if it wasn't tolls, some other issue would have gotten all that ad money. Instead, it makes a lot more sense to say that type of enthusiasm gap was driven by anti-Trump sentiment that turned out a lot of Democrat voters. 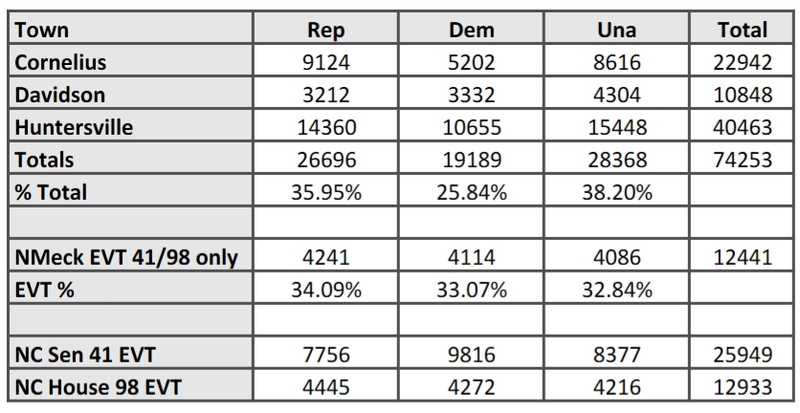 In a race like NC98 that enthusiasm gap wiped out the big lead Republican candidates normally have in that district. In MeckBOCC District 1 it easily overcame the smaller structural advantage Republicans have had in the past. In NC Sen 41 it made the results a foregone conclusion. 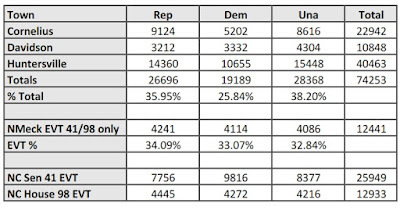 The most you can say about the impact of tolls on these races is that the divisions in the anti-toll community probably put Clark over the top in NC98, but it wasn't the driving factor why the race was close enough for that to matter in the first place. For that matter, the ridiculous attack ad flyers used in response to her TV ad campaign sent out by the NCGOP may have backfired and cost Bradford enough votes to cover her margin of victory. Those flyers turned off a lot of people. The tone of them could also be seen as an impact from Trump. Regardless, in a race as close as that one, any number of small campaign mistakes could be seen as the deciding factor. Trump, not tolls, caused this debacle for local Republicans, and while the party picks up the pieces and tries to regroup, the ongoing impact of national issues will likely make that more difficult. With early voting at the half-way mark, data from the MeckBOE website shows turnout favorable to Democratic candidates in the NCGA races for current Republican seats covering North Mecklenburg. Specifically, this analysis covers NC Senate 41 currently held by Jeff Tarte and NC House 98 currently held by John Bradford - both of Cornelius. It does not cover NC House 107 held by Democrat Chaz Beasley. North Mecklenburg has long been a Republican stronghold. In fact, Davidson Precinct 206 has been the only consistently blue area in Lake Norman for years. aShortChronicle posted about that previously in this post from 2012. However, since that time the I77 Hot Lanes controversy has turned some races on their heads with more voters crossing party lines in response to that controversial project. The most notable being the Governor's race in 2016 with 10's of thousands of LKN voters who had previously voted Republican going for Democrat Roy Cooper over Republican Pat McCrory. See the details of that here. While so far the I77 controversy hasn't trickled down in an impactful way to recent General Assembly races, there are vocal anti-toll voices both for and against the incumbents who have been working, to date unsuccessfully, to negate the tolling contract. That could be important if these races become close for other reasons. Those other reasons potentially impacting these races include the known fact of legislative redistricting and potential fact of a so called "blue wave" being driven by national issues. Redistricting will definitely impact the outcome of these races. Read about the details of that here. In NC Senate 41 currently held by Republican incumbent Jeff Tarte against Democrat challenger Natasha Marcus, the new district lines shift the race in favor of the challenger. In this race, the southern half of the district shifted from eastern Mecklenburg to western Mecklenburg. In the NC House 98 district currently held by Republican John Bradford against Democrat challenger Christy Clark, the new district became slightly more Republican with some shifts on its southern edge. Those redistricting impacts will have an effect and can be seen in the early turnout numbers. The impact of any "blue wave" remains to be seen, but the turnout numbers so far indicate something may be in the making. Check out the below analysis of data from the MeckBOE website. There are a few things to note on these numbers. This data goes through voting on Friday, 10/26 - the midpoint of early voting this election. The early vote turnout (EVT) numbers include all ballots cast and requested. It is assumed that the vast majority of mail in ballots requested will eventually be returned. The totals may look off slightly if one tries to reconcile them to the BOE raw data because these numbers don't include smaller party registration numbers and people in unincorporated areas for the North Meck totals. The North Meck totals for the towns only include Davidson, Cornelius, and Huntersville minus voters in NCH107, unincorporated areas, and the smaller parties as previously mentioned. Overall, these things won't change the overall outcomes of the analysis much if at all. Here's what these numbers tell you. First, Democrats are, so far, outperforming by a pretty significant margin in the North Mecklenburg towns relative to their voter registration percentage. That's could be taken as a sign of voter enthusiasm among Democrats. Since North Mecklenburg is heavily Republican, one would expect a bigger turnout lead for their candidates. Also, the overall turnout at North Mecklenburg polling sites is running significantly ahead of early voting in the last mid-term election in 2014. These things speak to the possibility of a blue wave, at least locally. Second, the turnout totals by electoral district show the major impact redistricting is having, particularly in NC Senate 41. The overall turnout lead the Democrats are building in this race is being driven entirely by the newly included southern portion. 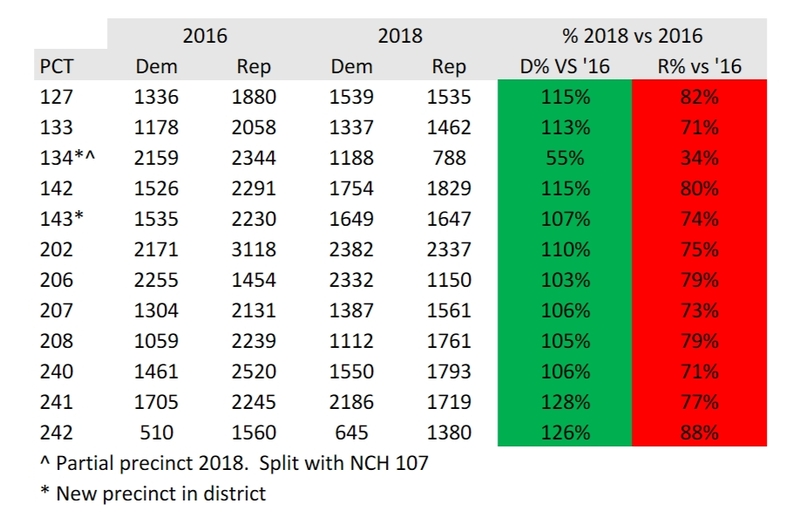 In NC House 98, redistricting, as expected, is helping Republican totals, but instead of significantly expanding a lead it is just helping them keep pace. Obviously, the big unknown is how unaffiliated voters break. There are some reasonable assumptions that can be made here. The most basic is that most UNA voters consistently vote one party or the other. Few actually are true ticket splitters. Based on that, it would be safe to assume that if registered Democrats are outperforming, that Democrat-leaning UNA voters are too. These assumptions, if true, may narrow the historical gap enjoyed by Republicans in NC House 98 race. In the NC Senate 41 race, the UNA votes cast so far are almost evenly split between the portions in the three northern towns and the southern part of the district. If one assumes the UNA voters in the northern part of the district are more Republican leaning and the UNA voters in the south are more Democratic leaning, that would mean they likely cancel each other out to a large part and won't close the 2000+ turnout gap the Democrats currently possess. If the trend continues, the Republicans will have to close that gap on election day when Republicans tend to turnout at higher rates. The larger the gap, the harder that will be to do. Finally, there is the unknowable impact national events and negative ads will have on these state level races. Will recent national events spur more turnout or ticket splitting than expected? Will the economy help Republicans? Will the negative ad flyers that have been landing in local mailboxes lately gin up the base or will they backfire? While early turnout data tells quite a bit, it's the answers to these unknowable questions that will likely determine the final outcome. DAVIDSON, N.C – Davidson residents are invited to offer input regarding existing roadways, new alignments, or a combination of both, with respect to the North-South Parkway at a public meeting on Tuesday, October 30 from 6:00 to 8:00 p.m. at Hopewell Baptist Church located at 18841 Davidson-Concord Road. A team comprised of staff from Iredell County, the Towns of Davidson, Mooresville, Cornelius, and Huntersville, the Lake Norman Regional Transportation Commission (LNTC), and the Charlotte Regional Transportation Planning Organization (CRTPO) are working to identify transportation alternatives for a north-south corridor from Eastfield Road in Huntersville up to Timber Road in Mooresville. In 2018 local jurisdictions, including the Towns of Huntersville, Davidson, Mooresville, Cornelius, and Iredell County agreed that a comprehensive effort must be undertaken to link their efforts together in a cohesive manner. Your input is critical for providing local communities with a cohesive plan for a new north-south transportation corridor. Please visit www.Northsouthparkway.org for more information. Roads and water drive development. That's no secret to anyone paying attention to growth in the area over recent years. On Tuesday evening, there will be a hearing regarding the environmental impacts of a multifaceted road project just north of Davidson in Iredell County called the East West Connector. This project will drive the next tsunami of development in the Lake Norman area opening up thousands more acres for large scale projects over the next decade. Projects like the Lake Davidson development proposed last year will become more likely whenever these road projects occur. aShortChronicle posted several stories on that project. The EWC will also support developments like the Province at Lake Norman written about back in August, and the $1 billion Silicon Shores announced in July will also be greatly enhanced by this road project. For more on how this EWC project could open up large scale development, check out this post from the Lake Davidson series. The eventual numbers are staggering. Here is the notice put out by Mooresville on the project. 4,310 linear feet of fiber lines; and26 Intellistreets Luminaires. Charlotte City Council is roiling the political landscape in the Queen City with serious discussion of changing from two year terms to 4 year terms for its elected officials. In recent days, both current and former electeds have come out both for and against the idea in Charlotte Observer op-eds and on social media. This is an issue near and dear to aShortChronicle from back when tiny Davidson was considering the same thing in 2010 and 2012. Long-time readers will know this idea of longer terms for electeds was one of the driving stories in the early days of this blog. In fact the first stories consolidated into a dedicated "Chronicle" page were on this topic. You can find them here at the Davidson 4-Year Terms Chronicle. If you were to read through those old posts about Davidson as well as the current online arguments going on in Charlotte, you see many similar reasons for and against the idea. Proponents like being elected officials but don't like campaigning. They see 4-year staggered terms as providing "stability" Opponents think 4-year terms reduce accountability and see making such a change without a referendum as undemocratic. When these debates are in the heat of battle all of these arguments are just speculation. The idea of stability sounds good. The idea of small-d democracy sounds good. Nobody really knows who is right. Yes, Charlotte is exponentially bigger than Davidson. Yes, Charlotte is less politically diverse than Davidson with the makeup of its current Board being in near solid lockdown by Democrats. However, Davidson does provide a pretty clear example of why 2 year terms is a good idea and Charlotte residents should fight to keep them. When Davidson Commissioners were considering a unilateral change to 4 year staggered terms without going to voters, the idea failed because of strong citizen pushback. There was no way of knowing at the time, but the defeat of this powergrab by Town Hall would have positive consequences years down the road. In the years after keeping 2 year terms Davidson's future Board promoted a series of unpopular ideas. These included the failed Catalyst Project, the failed Beaty Street RFP, the controversial Griffith Street Hotel now mired in the courts, the idea of massive spending for a new Town Hall without voter input, and the Rural Area Plan mass rezoning, among others. Stopping that line of thinking and the constant controversy it caused required a wholesale changing of the guard. In 2017, on the back of the Save Davidson movement that wholesale change occurred when 5 of 6 elected officials were changed in a single election cycle. In the 10 months since the new Board has been sworn into office, there has been a noticeable change of tone coming out of Town Hall. There is noticeably less swirl. There is noticeably better decisionmaking. That would not have been possible under 4 year staggered terms. At most, only 3 officials could have been turned over under that scheme, and the Town would still be swirling. That is the cautionary tale the voters of Charlotte should consider before laying down and accepting what their leaders are proposing. Even if you like how Charlotte runs now, there might come a time when things change. It is better to have the option of making change and not needing it, than to need that option and not have it. 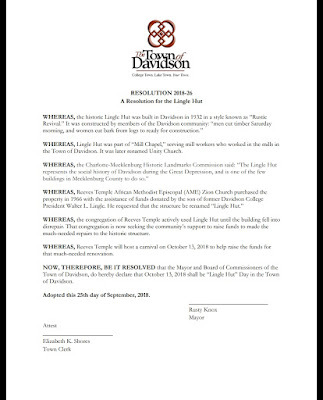 At its September 25th Board of Commissioners meeting, Davidson declared October 13th as "Lingle Hut Day" in town. 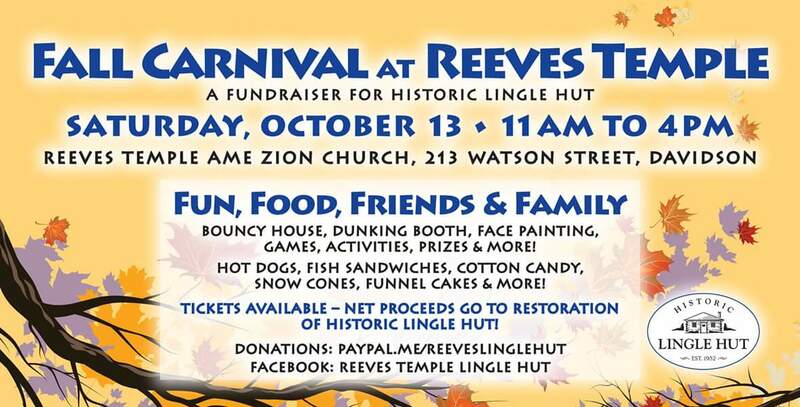 This proclamation supports the ongoing fundraising efforts to raise money for the restoration of the historic building on Watson Street at Reeves Temple AME Zion Church. See the proclamation below. aShortChronicle previously told readers about the project where church members and local volunteers are hard at work planning to restore the site which had previousmy served as a gathering place in the Westside community. The initial phase of the effort needs $20,000 primarily to fix the foundation of the building, and to date more than half of that sum has been raised. 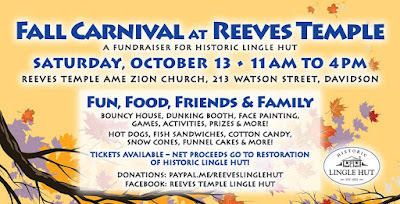 Volunteers have been selling engraved bricks at the Farmers Market for the effort among other donations, but this Saturday, 10/13 will be the biggest push yet with a Carnival at the Church. Plan on hitting the Farmers Market then heading over to Watson Street. It will be a great way to support the community, and in this case, literal community building efforts.